Set in a neoclassical building in the Pigalle district, this ultrachic hotel designed by Jacques Garcia is a minute’s walk from Moulin Rouge, a two minute walk to a metro station. Featuring a mix of exotic and Second Empire–style furnishings, the opulent rooms come with free Wi-Fi, smart TVs and minibars. The 1- and 2-bedroom suites add plush sofas. In-room massages, butlers and 24-hour room service are available. An elegant lounge offers a library, a fireplace, and a bar that serves meals. There’s also a courtyard. A spa has an indoor pool and a treatment room. Between history and modernity, romance and comfort, the hotel-spa offers a unique change of scenery, a plunge into the culture, the art, and typical Parisian well-being. A family secret revealed with the greatest discernment, Hotel Adèle & Jules scores double points… Set in twin low-rise buildings, on a quiet private road, the place beckons peace and relaxation, close to yet sheltered from the buzzing hub of the Grands Boulevards. 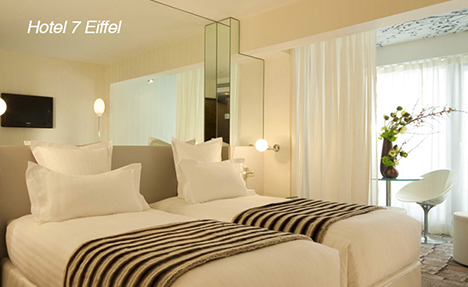 Named for Empress Joséphine Bonaparte, this swanky boutique hotel in the 4th arr. built at the site of a 17th-century convent is a 3-minute walk from Saint-Paul metro station. It’s also 2 km from Musée du Louvre. Individually furnished in Directoire style, the opulent rooms and suites provide free Wi-Fi and flat-screens. All have minifridges, tea and coffeemakers, and eclectic wall prints, as well as mosaic-tiled bathrooms with rainfall showers. Why see Paris like a starving artist when you can rock it like the Sun King? Hanging with Hemingway, Scott & Zelda, Picasso, and the crew for mind-bending soirees at Gertrude Stein’s pad has its appeal. But in reality, life was harsh and fruitless for the many thousands of the ‘Lost Generation’ whose creative juices led them from America to garret apartments in Paris in the early decades of the 1900s. Perhaps Louis XIV’s acquaintance would be a better choice, since the Sun King and his retinue knew only the gilded opulence of Palais Royal, Chateau de Bagatelle, and Versailles. It’s possible these days to get a modern send-up of what court life was like, even if only for a week or so. You can rent Paris luxury apartments, and you don’t need to be royalty to afford them. Villa-style accommodations throughout Paris, are available for roughly the per-person price of a quality hotel room. Two catches: The first is you need to travel with a larger group, say four to eight people, to defray the cost. The second catch is to save euros by cutting back on restaurants and eating in, after gathering a bounty from outdoor markets, patisseries, and charcuteries. Both these ‘catches’ may be deal-breakers, especially for those who go to France primarily to partake of restaurants. But keep in mind, these luxury retreats are places you will want to be in the morning for coffee, and in the evening to wind down with wine after a day of pounding the cobblestones. Expect deluxe modern kitchens, baths, extra living space, and outdoor areas in prime locales—you won’t be in a hurry to leave. After deciding to take the quantum bump up in luxury, the question becomes, which one and where? The overview: Paris is not huge—roughly a seven-mile-wide oval, encircled by the high-speed Boulevard Peripherique and cleaved east-to-west by the river Seine. It’s divided into 20 neighborhoods called arrondissements. Connecting everyplace to every other is a warren more than a dozen different Metro lines, with several hundred entrance stations. Two islands in the Seine—Ile de la Cite and Ile Saint Louis—are at the literal and historic center of Paris. Armies from all of Europe crisscrossed this spot for 20 centuries. Today, for tourists, this is where the ‘action’ is. 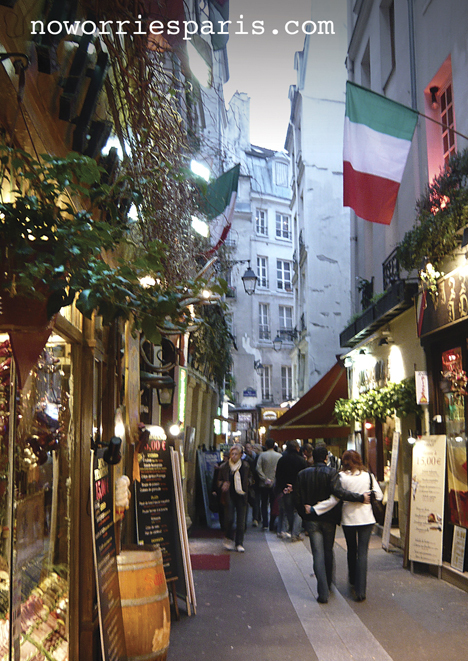 On the Left Bank are the narrow streets with captivating cubbyholes and exotic restaurants. Notre Dame has dominated Ile de la Cite since its first stones were laid in 1163. After several centuries of remodels, the grand cathedral was nearly demolished by Napoleon in the early 1800s, but author Victor Hugo stirred the public to save it with his 1831 novel, The Hunchback of Notre Dame. Not far from Notre Dame (look for a line of people) is Sainte Chapelle. This church housed booty from the Crusades in the 13C, but is known today for its stained glass—15 towering windows, streaming bejeweled light in primarily red and blue hues. After buzzing the Left Bank, you can exit uphill on Rue Galande on what was the start of the ancient route to Rome. The swerving ascent takes you to Gothic St. Etienne du Mont—built on the site of a 6C abbey that King Clovis dedicated to Sainte Genevieve after her prayers stopped Attila the Hun’s march on the city. Lofted on a hill not far away is the Pantheon, also a tribute to fair Genevieve, this time by Louis XV in 1764, after he recovered from an illness after praying to her. The light inside is heavenly. If you make it this far, it’s wise to press on a few blocks to Place de la Contrascarpe, where Papa wrote A Moveable Feast. One of the best outdoor market streets in Paris, Rue Mouffetard, snakes down from this place. St. Germain des Pres is quintessential Latin Quarter—a blend of centuries-old architecture and the right-now glitz of cafe society. Musée Nationale de Moyan Age is housed in the medieval Hotel Cluny, which was built on top of Roman baths that date from the second century. The museum is a walk through time. Across from this masterpiece is another, la Sorbonne, the 13C college to which the Latin Quarter owes its intellectual heritage. But the campus is contemporary when compared to Abbey St. Germain des Pres, not far away, which ruled the roost in Paris from the mid-6C, until clashes with students diminished its influence (300 monks were slain) in the 1300s. Next to the abbey on the boulevard is the holy triumvirate of Parisian cafes: Brasserie Lipp, Cafe de Flore, and Cafe de Deux Magots. Each place had its own patrons (Sartre, Camus, Picasso, and many other big-brainers) and schools of thought, though esoteric distinctions were often fuzzed by absinthe. Also in the ‘hood is the city’s most ornate church, St. Sulpice, built in stops and starts over a century, beginning in 1646. Inside are frescoes by Delacroix, who loved moving his paintbrush to the melodic groans from the world’s largest organ (count ’em, 6,600 pipes). The heart of the arrondissement (some would say of Paris) is Jardin du Luxembourg, a few blocks from St. Sulpice. Sixty acres of leafy trees, fountains, and statues have been absorbing legions of leisure seekers since Marie de Medici first laid out the park in 1615. The weighty Palais du Luxembourg has housed the French Senate for two centuries—except when it was Nazi headquarters during World War II. Place de la Concorde is meant to be seen from the center of its 20-plus acres—reached via a dash across umpteen lanes of traffic. The place is the austere centerpiece of the Axis Historique, a line-of-sight up and down the Champs Elysees from the Arc de Triomphe through the Jardin des Tuileries to the glass pyramid at the Louvre. The 3,300-year-old Luxor Obelisk stands in the center and two huge fountains act as bookends. This grand space is best known, however, as the primary site for the guillotine that in the late 1700s took the heads of Marie Antoinette, Robespierre and 1,300 hundred other souls loyal to Louis XIV (hmm, maybe being a starving artist isn’t so bad after all). At right angles to the Axis Historique (forming a second axis) is Rue Royale. The view is past the American Embassy and the lavish Hôtel de Crillon (under renovation) to Sainte Madeleine. This church’s mountainous staircase and forest of columns were built to glorify Napoleon’s conquests. Branching off Rue Royale is the ground zero of haute couture, Rue du Faubourg-St. Honore, the home turf for Chanel, Dior, Prada, and everyone else in the biz. Also in this zone is Place Vendome, a chi-chi address for Parisians since 1702, and home to the Ritz Hotel, watering hole for the rich and well-heeled. You may have gathered that the theme in this part of Paris is old money. The Pompidou Centre Musée Nationale d’Art Moderne (a name seldom referenced) is a building turned inside-out, its glass facade revealing an infrastructure of colorful tubes, pipes, and elevators. The art inside runs the gamut (if there is one) from Cubism, to Surrealism, to Pop Art. The sprawling grounds outside are always popping. More traditional, must-see museums are nearby: the revamped Musée Picasso, Musée Carnavalet (the history of Paris), and the Archives Nationales. Tradition reigns supreme at Place des Vosges, the oldest square in Paris, having been laid out by bon vivant Henry IV in 1604. Vosges went through generations of squalor, but was respectable by the time Victor Hugo moved in at the beginning of the 1800s. Maison de Victor Hugo, now a museum, takes up several floors in a corner of the place. A dozen grand avenues converge at the Arc de Triomphe forming Etoile—The Star. The most prominent avenue is the Champs-Élysées, with 50-foot wide sidewalks whose cafe tables have provided ringside seats for parades, starting with the Napoleonic Wars and extending to each year’s conclusion of the Tour de France. The view from the top of the arch reveals the Axis Historique, version 2.0, as it extends west for several miles, across the Seine, and through the center of La Defense—the enormous cube-arch (Notre Dame could be garaged inside) at the center of the sky-scrapers of modern Paris. A more traditional view of Paris unfolds along a stroll up staid Avenue Hoche, past treed estates with wrought-iron gates, leading to sublime Parc de Monceau. This 40-acre oasis is of the wild, English style (as opposed to the formal Luxembourg and Tuileries). Strollers, joggers, and kids-gone-wild at the park’s playground fill up the space on weekends. Numerous architectural follies (Corinthian columns, Dutch windmill, Egyptian pyramid) accent the Monceau’s wide oval path and pond. The French art of conversation has been perfected on these park benches since the late 1700s. Though Tour Eiffel is the city’s most-touristy spot, the surrounding neighborhoods are where locals live the good life. Several market streets are nearby: Rue Cler, Rue Sainte Dominique, and along Boulevard de Grenelle. Providing room to roam at the foot of the famous tower is Champ de Mars, 60 acres of formal greenspace that lead to Invalides. At Invalides, the city’s masculine side is on display at Napoleon’s Tomb and Musée de l’Armée. Also near the Eiffel Tower are Musée Rodin and Musée d’Orsay, which is set in an ornate former railroad station and houses the art that bridges the gap between ancient (at the Louvre) and the modern (at Pompidou). Even with all the 7th has to offer, no doubt the star of the show remains the Tour Eiffel. It draws eyes like magnets. Though many visitors will want to go to the top (1,063 feet), the more intimate view is from the 2nd level (a 15 minute walk up stairs), and the more majestic is from across the Seine at Place du Trocadero. From the plaza at Trocadero—flanked by the twin museums of the neo-classical Palais de Chaillot, and the fountains of Jardin du Trocadero—the Eiffel Tower and all of Paris is laid out before you, an immoveable feast for the senses. Where? Passy may seem passé to all visitors except aficionados of Brando’s Last Tango in Paris, which was filmed here. But not to Parisians: these enclaves across the Seine (like Villa Montmorency) are where the real monied folks live —the kind that don’t want to be famous in most cases. A historical exception is the former home of Honoré de Balzac on the upper bank of the Seine. Now a museum, the grounds had a back gate so the notoriously indebted scribe could escape his creditors. Throughout this arrondissement (principally on Rue Fontaine and Rue Agar) are the fanciful art-nouveau stylings of architect Hector Guimard, who makes concrete look like meringue, giving a storybook vibe to a row of facades. By the time Metro line 10 gets to the village square at Notre Dame d’Auteuil, you’ll feel far away from Paris, especially when the scene amps in the summer during the French Open tennis tourney at Stade Roland Garros. Next to the stadium is perhaps the city’s least known jewel: Jardin des Serres. Five glass-and-wrought-iron greenhouses are placed within a seven-acre garden planted by Louis XV in 1761. Tickets had to be rationed in 1898 when the public was admitted, since the sunlit botanical interiors cured the winter blues for Parisians. The mother of all parks in Paris, Bois de Boulogne, is 2.5 times bigger than NYC’s Central Park and makes the 16th by far the largest arrondissement. Within the Bois is another getaway trip, to the château, orangerie, and rose garden of Parc de Bagatelle. Marie Antoinette spurred the building of the château over one summer in 1777. It soon became the “it” place for exorbitant gatherings. For years, partygoers reveled in the new game ‘bagatelle’—a mini-pool with bumpers that was the precursor to the pinball machine—until times changed and a new contraption called the guillotine became all the rage. If you detest standing in line or just being in crowded places your timing to go to Paris has never been better. Visibly noticeable are the shortened queues at the Louvre, Musee d’Orsay, Eiffel Tower, bateaux mouches, and special events. After recent major terror attacks in France, Paris is now seen as “less safe”. So it’s up to you to weigh the pros and cons. I myself will take a chance on Paris. Some vacation rental landlords are willing to “talk turkey” and reduce the rent especially if you’re booking within a month’s time frame. Hotels too probably will soon be forced to offer more affordable rates. A little direct negotiation with the front desk could mean extra savings for you. I’m hoping tourists regain their confidence and Paris returns to its superstar status of being one of Europe’s most visited cities. After all, 14.97 million international visitors adds up to a lot of croissants. As well as a lot of sold guidebooks: No Worries Paris, a photographic walking guide. Wrap up in a soft white monogrammed robe, pop the champagne and unwind in your cozy boutique hotel room after the long flight to Paris. The following are all well located with chez this chez that dining just around the corner. They range from ultra-mod Phillip Stark to chintzy French provincal plush. Scroll through our suggestions, click through to their home pages, then move on down to Trip Advisor for their reviews. You can book directly (most staffers speak some English and you’ll bypass the middleman fee) or price at Expedia, Travelocity, Kayak, booking.com or hotels.com. Do your homework, you’ll be rewarded $$$. Location is everything and all of these get our stamp of approval. Of course you know to book well ahead of your departure for the best deals. Price usually equates to the size of the room. Don’t be shocked at how tiny some are, especially the bathrooms. Most are ideal for short getaways when you can afford to spend a little more. Twenty to fifty dollars more per night can buy you a lot more room, amenities, charm and sometimes a free petit dejuner. Why you’re visiting Paris, non? Romantic and picturesque without being overly cute. Known for its accommodating staff. +33 1 4065 9595, Métro: Sèvres Lecourbe. Pizzaz, designer colors, in room computers. Rooms feature 19th-century architectural elements such as stone fireplace mantels and moulded ceilings. Notre Dame and the Louvre are less than 15 minutes away. 10 rue du Champs de Mars, 7th, +33 1 4062 6700, Métro: Ecole Militaire. Doubles from €119. Modern, can be noisy. Opening soon, their very own chocolate bar. Marble bathrooms and Fragonard toiletries. In summer the rooftop terrace is open to guests. 247 Bd Voltaire, 11th. For a change of pace, take a walk on the hip East Side. A Left Bank find (Montparnasse), somewhat out of the way but clean, well priced. 113 bis rue de l’Ouest, 14th, +33 1 4044 0963, Métro: Pernety. 29 Rue Jacob 6th, +33 (0)1 43 26 60 00. Popular, great reviews. Designer WOW. Right Bank. Murano-glass fixtures in the lobby. No front desk, instead a team of personal assistants to guide you. Champagne bar, campy, chic. 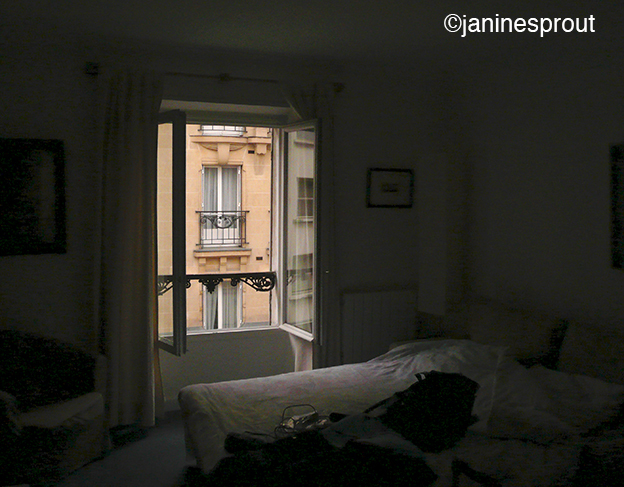 From totally basic (bed – usually convertible, kitchenette – alcove with two burner stove, sink, microwave, refrigerator, tiny bathroom w/shower, chair, table, tv, armoire) to French provincial splendor and views of the Eiffel Tower, here are some places to begin your search for a studio apartment. Pictured is what you get for about $125 a night. Location: right off the Champs Elysees. 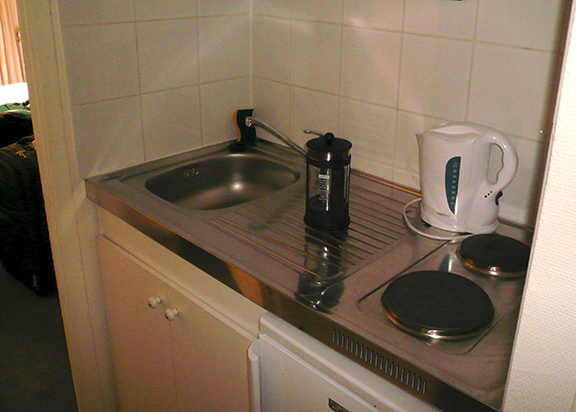 Not much, but where you stay matters if you’re walking Paris. 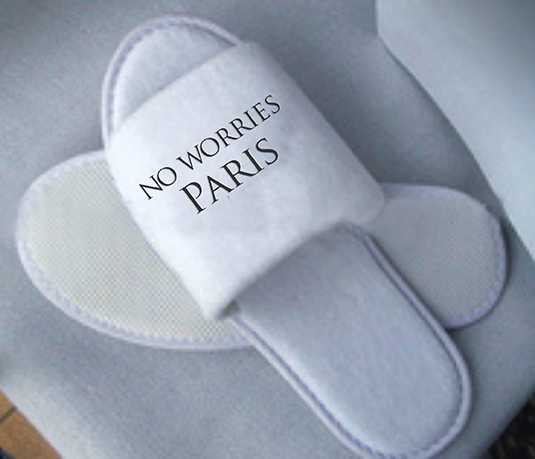 Remember to bring you No Worries Paris guidebook for all the essential routes. 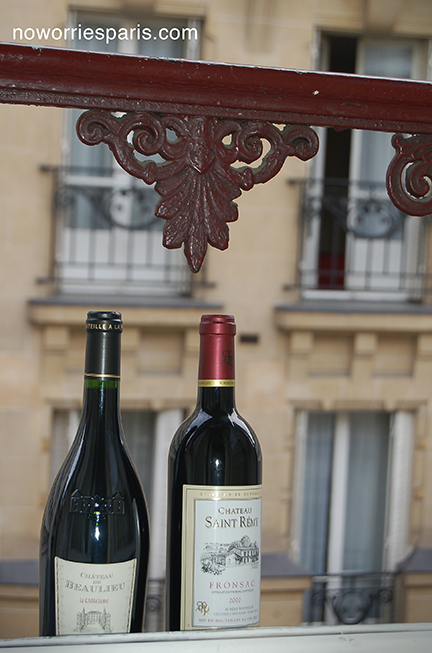 TripAdvisor Paris: a good solid source with photos and reviews. http://www.vacationinparis.com: my favorite. They send you the keys. Nice variety hand selected, proven. Reserve early. Paris Perfect: another agency with well located properties. Start your search a few months before you go. The good properties that are priced low are snatched up by those in the know. The 8th arrondissement holds some interesting possibilities ranging from small family run hotels to boutique to luxe. Here are a few with wonderful locations, just off the Champs, on the “right” side of the Right Bank, close to the metro lines.